Sarah: Yeah. My name is Sarah DiGregorio, and my cookbook is called Adventures in Slow Cooking, 120 Slow-Cooker Recipes For People Who Love Food. And I have a foreword by Grant Achatz and recipes for weeknight dinners, party food, desserts, cocktails, and more. Suzy Chase: You wrote in a piece for Food & Wine magazine, "That bulky contraption you only break out for chili night is one of the most powerful and versatile tools in your kitchen." Tell us about our beloved slow cooker. Sarah: So I think that a slow cooker is one of the most sort of underappreciated and, like I say, underutilized tools in the kitchen. It can do a lot more than people realize. I think a lot of people keep a slow cooker around sort of in the back of a cabinet, and you know you bring it out to make a stew when it gets cold out or chili night, things like that, and the slow cooker is great for those dishes. It works really, really well, and there are many, many great recipes out there for those kinds of dishes. But one thing that I realized when I was an editor at Food & Wine magazine, I was talking to Grant Achatz for a story about slow cookers, and he was just rattling off all these dishes that you can make in a slow cooker. So he was telling me about steamed British puddings and dumplings, and in particular, custards, using the slow cooker as a water bath for custards. And I thought, "Well, that makes sense," but also it just also seemed really counterintuitive to me and very much a surprise. And so I went home and I started tinkering with my slow cooker and trying some of the things that he had mentioned. And of course, he was completely right. And I just, I think that there's something really wonderful about discovering that this very familiar kitchen tool and something that a lot of people have a lot of affection for, something that you remember maybe your parents using or your grandparents using, there's something really wonderful about taking it out again and using it not just for the things that you have nostalgia for, but also using it in different ways and sort of bringing it into the modern kitchen. Suzy Chase: So this cookbook goes well beyond soups and stews. Other than custards, what is one surprising slow cooker recipe in the cookbook? Sarah: That is a great question. So one thing ... I don't know how surprising this is to people, it was a surprise to me, how well the slow cooker makes polenta. So polenta, especially traditional polenta, the kind that is not quick cooking and not instant, it can take a little while on the stove top and can make sometimes kind of a mess when it pops and bubbles a bit. And one thing that I really loved to discover was that polenta cooked very slowly in the slow cooker is really beautiful and it gets very creamy and very tender. And I used a bit more water, so the ratio of water is a bit higher than what most people use on the stove top, but what happens is that the polenta ends up having a long time to hydrate, so it gets very, very tender, very creamy. It has a very rich and intense corny flavor when you cook it slowly in the slow cooker. So that was one surprising ... surprising to me, at least, and I feel like that's a very useful thing. Another surprising thing is maybe to think about braising vegetables in the slow cooker. So most people think about braising meat in the slow cooker, but actually, vegetables are beautiful in the slow cooker. So for instance, I like to do beets. And what happens when you braise vegetables low and slow is that you end up with just a little puddle of the juice from the vegetable, because I don't like to add extra moisture to the slow cooker when I braise vegetables, because the vegetables bring their own moisture and you don't want to end up with something that has too much moisture. You sort of end up with that washed-out flavor that sometimes you get in slow cooker recipes. So what I do is I just put beets pretty much directly into the slow cooker with salt, a little bit of olive oil, and I let them go. And when they're ready, they're very tender, they're very sweet, and you have this little puddle of beautiful beet juice at the bottom of the slow cooker, which I mix with some sherry vinegar and just pour over so it kind of has like a self-saucing, self-saucing beets. And it just sort of reinforces that flavor so it's a very intense and yet mellow kind of flavor. I love that kind of thing. I do a similar thing with cherry tomatoes, where I mix cherry tomatoes with just a bit of salt, olive oil, and a little bit of honey, and I crack the lid so that the moisture will evaporate. I let them go for a long time and they get very, very, very intense, that sort of wrinkled, sweet, caramelized cherry tomato confit almost. It's really a nice thing to do. So I like to encourage people to think about braising vegetables instead of meat in the slow cooker, because it just works so well. Suzy Chase: What do you do with those cherry tomatoes? Do you just eat them or do you put them on something? Sarah: Yeah. Well, you can do almost anything with them, but I toss them with pasta. They make a great quick, a very fresh tomato ... sort of a blistered cherry tomato sauce for pasta. I also really like them just spread, toast thickly with ricotta, and then just pile that on top for a really simple dinner or lunch I think is really, really wonderful. You could also use them as a topping for grain bowls. They just carry so much flavor, and they keep in the refrigerator for a long time, so it's a very versatile thing to have around. Suzy Chase: Give us a short history on the slow cooker and Irving Naxon. Sarah: Yeah. So this is such a great story. I love this. I love that the slow cooker has a good story behind it, because it seems like the kind of cooking tool that should have a good story behind it. So Irving Naxon was an inventor, and his mother came from Lithuania. So his mother immigrates from Lithuania, and their family was Jewish and they came from a village that was mainly Jewish in Lithuania, and he remembered his mother telling him that there was a communal oven. So everyone in the village would make a pot of stew on Friday, and before the sundown, before the Sabbath, everyone would bring their pot of stew to this communal oven, because during the Sabbath from sundown to sundown on some Friday night to Saturday, in the Jewish tradition you aren't supposed to do any work. So everyone would bring their pots of stew to this oven, and the baker would bank the coals, so let the coals just kind of fade and make this gentle heat that could go unattended for the rest of the night and the entire day the next day, and then everyone would come back and get their pots of stew that had been bubbling away very, very gently all day unattended, and bring them back, and this would be sort of the family dinner for Saturday night. And he remembered his mother telling him about this and how delicious those stews were and what an ingenious way this was to end up with a hot cooked meal on Saturday when you couldn't be doing any work in the kitchen on Saturday. And so he decided that he would try to replicate this, so the idea was for him that you could plug it in and let the stew go, and if you were observing the Sabbath on Saturday, you could just let that stew cook and then have a beautiful hot meal when you were ready to have it on Saturday night without having even lifted a finger on Saturday. I think that there's something really, really evocative about that, because it's sort of rooted in the immigrant experience. It feels to me like a very American story, and I love it. I love that that's where its focus comes from. Suzy Chase: Is it Crock-Pot or slow cooker? Sarah: So Crock-Pot is a brand name, and so slow cooker ... it's sort of like tissue versus Kleenex, so Kleenex is actually the brand ... right. So Crock-Pot was what when ... the Rival Company bought the slow cooker from Irving Naxon in 1971, and when they did that, they rebranded it as the Crock-Pot. He had called it a beanery. He had called it a couple different things, but mainly he called it "Naxon Beanery," and they rebranded it, called it a Crock-Pot. But the generic term is "slow cooker." Suzy Chase: Hugh Acheson said that slow cookers are a gateway to get people to cook from scratch again. Do you think so? Sarah: I think that the slow cooker is a really wonderful tool, because it meets you where you are. And that can change from day to day for everybody, I think. There are days when I am running around and I don't have time to do anything other than maybe throw some eggplant into the slow cooker, a few spoonfuls of harissa, and then before we eat I toss in some chickpeas, and that dinner, I spent maybe 10 minutes on that dinner total. And it's wholesome and it's home made, it's comforting. So I think that that's absolutely true. When you don't have time and you need to make dinner for your family and have it be something wholesome and something delicious, the slow cooker can meet you where you are. Suzy Chase: So give us some slow cooker tips. Let's say we have raw ingredients, like onions or mushrooms. Now, should we saute them before popping them into the slow cooker? Sarah: Yes. Ingredients like onions and mushrooms that have a lot of moisture in them, in most cases I think you need to saute them before you put them in the slow cooker, because if you don't, their texture is never quite right. In a lot of different recipes I tried really hard to not ask people to saute the onion, because I know it can be annoying to be like, "Now I have to saute the onion before I put everything in," but I really think it's better. It takes an extra five minutes and it really is better, because what ends up happening is, first of all, you draw the liquid out of the onion so that you don't end up with extra moisture in the finished dish. So when you saute the onion, you are drawing the moisture out of it a bit. And then also, you are getting that browning and that sweetness from the onion that really sort of suffuses the final dish and makes that flavor so much deeper and better. And then also, the texture of the onion breaks down a bit so you don't have sort of weirdly crunchy bits of onion at the end. So I do think that for things like onions, for things like mushrooms, it is important to saute them before you put them in. Suzy Chase: What about frozen foods? Defrost or don't defrost? Sarah: It's a safety issue with things like frozen meat. You cannot put it in the slow cooker, because it won't come up to temperature fast enough, so you really can't do that. For things like frozen vegetables, it is much better to defrost them first, because you can end up with too much liquid otherwise, so it's better to defrost, drain, and then put them in, because one thing that you have to be careful about in the slow cooker is you just get much less evaporations than you do with other cooking methods, so one thing that I think makes people think that they don't like slow cooker cooking is that they have maybe had a bad experience in the past with a recipe that ends up with too much liquid. So you just have to be conscious of that when you're putting together a slow cooker recipe, that you want always to have a little bit less liquid than you would normally, because you won't get the same evaporation that you do in the oven or on the stove top. Suzy Chase: Speaking of liquid, what do we do about condensation? Sarah: Yes, condensation. So it is important to be aware of this with the slow cooker, because you have the lid on all day, so the condensation rises up and drips down and you don't lose any of it to evaporation. And in some cases that can be great. So for instance, like I was saying about braising vegetables, I love to think about vegetables as sort of self-softing in the slow cooker, so you sort of end up with this closed, moist cooking environment that can end up ... you can get a lot of flavor that way. But there are certain cases where you want to be careful of it, so there are a couple ways that I deal with that. One is that it's okay to crack the lid in some cases. Manufacturers will tell you not to do this, because technically, if you crack the lid, they can't be assured that the temperature will rise fast enough, high enough fast enough, but for things like ... so I wouldn't do that for something like ... I wouldn't put brisket or chicken in the slow cooker and then crack the lid and walk away for eight hours. I would not do that. But for something like those tomatoes that I mentioned, the caramelized cherry tomatoes, I do crack the lid, because I'm not concerned about them reaching a certain temperature to be cooked through. Instead, I want to make sure that their moisture is being slowly evaporated. And then in some cases, what I do is I will just line the lid with paper towels. You could also do this with like a clean cloth towel, but I find that paper towels are just ... because they're thin enough that you can get the lid closed over them, so they're easier. So I do that for things like custards where I don't want the condensation to gather at the top and then drip back down onto the surface of the custard. It wouldn't be the end of the world, but it's just not particularly nice. It kind of ruins that beautiful silky top. So in that case, what I do is I just put down a layer of paper towels and then close the lid on top of it, and that way what happens is any condensation just gets absorbed by the paper towels and it doesn't jump back down onto the surface of the custard. Suzy Chase: Describe how we can sear or brown directly on our stove top. Sarah: There are a couple models that have inserts, like the crock, that is stove top safe. So I have one, actually, that I really like. It's a Hamilton Beach model. And the crock, actually I can just put it on the stove top like any other skillet. I can saute my onions, I can saute my aromatics, I can brown my chicken, whatever it is I'm doing, and then I just pop the insert back into the slow cooker casing and turn it on. So that can be very useful if you slow cook a lot. It can be useful to think about getting a model that you can saute on the stove top, and it sort of saves you a pot. But it's certainly not necessary. You can just as easily saute your onion and your aromatics in a skillet and then just transfer the food from the skillet into slow cooker before you start. Suzy Chase: Will the crock stay "stove top safe" on it? How will we know? Sarah: That's a good question. The box would certainly ... it's a big selling point for models that are stove top safe. The box and the instructions will definitely say, "stove top safe." If you have a traditional slow cooker that is like a heavy stoneware crock, I would very much assume that it is not stove top safe. Most of them aren't. But what you could do is see what model number you have, what brand and what model number, and just search it online. The crock itself will not say it on it, I don't believe, but you could certainly find that information if you know what brand and what model you have. Suzy Chase: How do we tackle crunchy foods like granola or spice nuts? Sarah: That is a good question. So like I said before about cracking the lid to allow for evaporation with things like the cherry tomatoes, you can do a similar thing with granola and the spice nuts. And in this case, what you're doing is you're really using the slow cooker as a gentle toaster. So I love to do this kind of thing, because it doesn't require you turning on your oven, it's very hands off, and it toasts really gently and it ends up with a really nice result. So in this case, what I do is, for instance, I have like an Indian spice Chex Mix. I just put the mixture into the slow cooker and I crack the lid to make sure that all of the ... to make sure that everything will stay crunchy. And then I just stir it a couple times and let it go until everything is toasted. And that's a really fun way to use your slow cooker, especially around the holidays. Suzy Chase: Our last tip. How do we use bakeware and our slow cooker? Sarah: That's a great question. As long as your bakeware is oven safe, you can use it in the slow cooker. So this was a discovery that I was really happy to make, because when you cook desserts in the slow cooker, you can certainly cook certain things in the crock itself, but it really opens up your options when you realize you can put like a souffle dish in there, you can put a bunch of ramekins in there. You can even put things like canning jars. I like to do these little mini cheesecakes and I make them in canning jars so everyone gets their own little cheesecake in a jar, and it's delicious and it's a very fun presentation. So any kind of bakeware that you can use in your oven, you can use in your slow cooker, so for instance, those little oven-safe ramekins. I also have a four-quart ... four-quart? No, sorry. It's a two-quart, a two-quart souffle dish that I make sticky toffee pudding in. And as long as it fits in your slow cooker and it's oven safe, it is completely fair game. And that can be really fun. Another idea that's in the book is I make a ricotta cheesecake in a loaf pan, so just a loaf pan like you would make banana bread in. It fits in your oval slow cooker and it's kind of a fun presentation, as well, because then you end up with this cute little rectangular cheesecake, which is very delicious and looks nice, too. Suzy Chase: I made your recipe for Apple Spice Overnight Oatmeal with Hazelnuts on page 64 over the weekend. Suzy Chase: And as a mom, I'm the one who gets up and makes breakfast for everyone in the morning, so it was so luxurious to have breakfast already made and ready to go. It was really good. Sarah: Yeah. I am not the breakfast maker in my home, because if I were, no one would ever eat breakfast. So I was very attune to the problem of getting breakfast on the table, especially for little kids, when you're not a morning person. I'd much rather do it at night and then have it ready in the morning. So I'm glad that that worked for you. Suzy Chase: No, it was perfect. I had a glass of wine. I was making the apple mixture. It was all ready when I woke up. Sarah: Yeah, exactly, exactly. That's great. Sarah: You can find me at sarahdigregorio.com, that's Sarah with an H, and then D-I-G-R-E-G-O-R-I-O, dot com. I'm also on Twitter at Sarah Digregorio, and on Instagram at Sarah E. Digregorio. So those are my ... and I'm always happy to hear from people. I am truly grateful to everyone who picks this book up, and I am very, very, very happy to answer any questions, talk things through. People have ideas about a variation that they want to try, I'm always happy to hear from people. Suzy Chase: Adventures in Slow Cooking is about rethinking how to use this magic appliance. 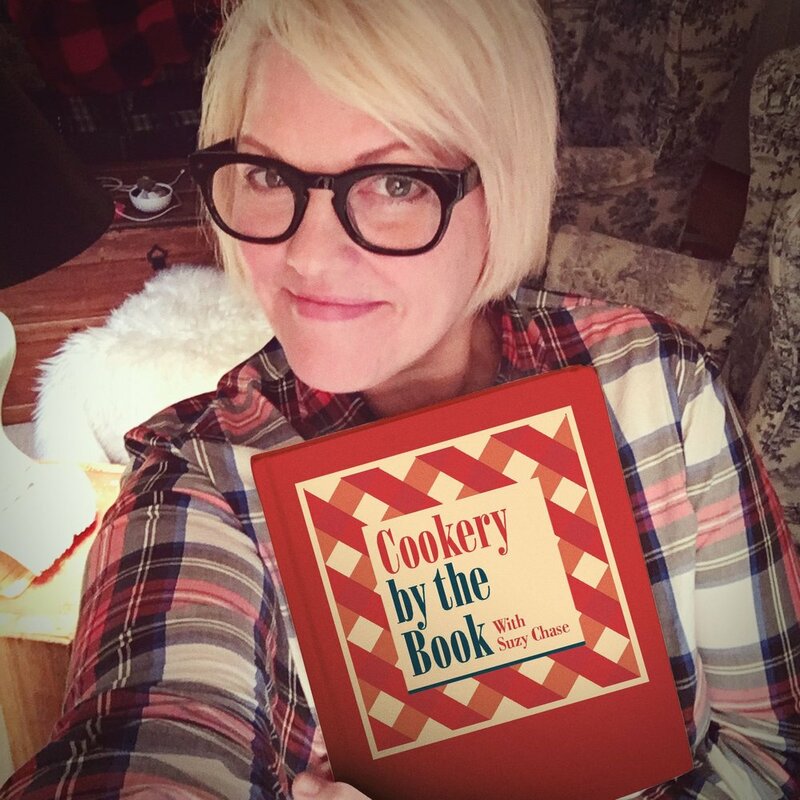 Thanks, Sarah, for coming on Cookery by the Book Podcast. Sarah: Oh, thank you. It was such a pleasure to talk to you. Suzy Chase: Follow me on Instagram at Cookery by the Book Twitters. I am Suzy Chase. And download your Kitchen Mix Tapes. music to cook by on Spotify at Cookery by the Book. And as always, subscribe in Apple Podcasts.